Beezus is nine and she’s got a bratty handful of a four-year-old sister, Ramona. Beezus likes to embroider pot holders, read books, and take art classes. Ramona likes to ride her tricycle in the house while playing the harmonica, wander off in search of the end of the rainbow, and bug the crap out of her sister. 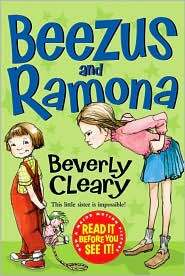 When I was seven or eight, Beezus and Ramona was one of my very favorite books on the planet. I loved Beezus and loved despising Ramona. For thirty years the images in Beverly Cleary’s books have stuck with me even though I don’t remember reading them more than once or twice. This time around, I relented a bit on my strict anti-Ramona stance. It wasn’t easy. But at one point, Beezus begs Ramona to stop checking out books about steam shovels and get something more girlie. Hrmph! Ramona, of course, stays true to her steam-shovel-loving ways and I was proud. I like to believe Beverly Clearly was a little ahead of her time, making Ramona a feminist and individual in a pre-Feminine Mystique era. Nice work, Ms. Clearly. The 1955ness of Beezus and Ramona is a little hard to escape and I wonder how younger readers would react. In our overprotective society a nine-year-old girl and her four-year-old sister would never be allowed to walk to the library alone, or to art classes at the park. And, I do have to give props to Cleary for Aunt Beatrice who comes in and saves Beezus’ Birthday. Aunt Beatrice’s character was one I didn’t remember, sadly. She made reading this book quite cathartic. Another thing that struck me about this book was what a debt Judy Blume probably owes Cleary. Tales of a Fourth Grade Nothing (which I just reread) shares a lot of the same story elements (parties, younger siblings ruining something important, food issues, etc.). I’d even go so far to say that Beezus and Ramona are female precursors to Peter Hatcher and Fudge (maybe this is a well-known fact in the world of children’s literature, I have no idea). Even though Tales is funnier, Beezus is no match for Peter Hatcher’s wit, Cleary’s book is still a fun and funny (mostly situational funniness) book that any one with a sibling (whether bossy older or bratty younger) will enjoy.